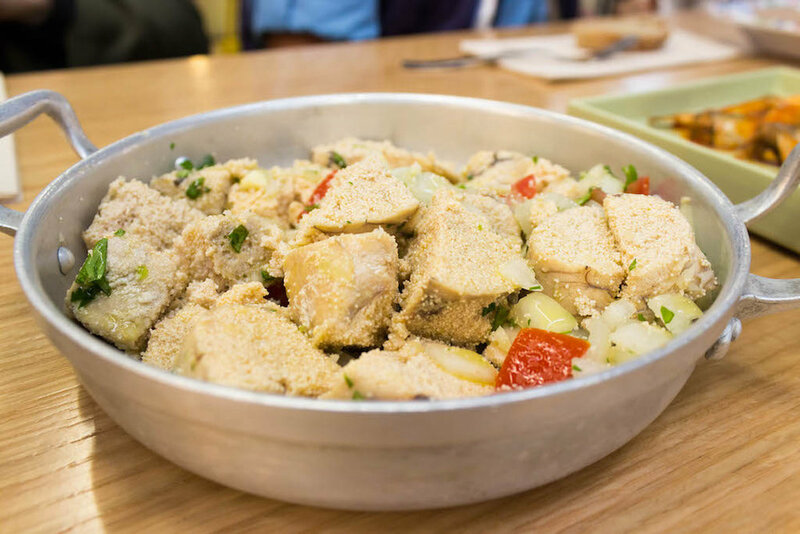 Taste of Lisboa food tours' aim is to show the real Lisbon to you, the one locals live in, and save you from feeling lost and overwhelmed when visiting. The company focuses on non-touristy and off-the-beaten path food tours - my favorite type of tour because they are generally the best representation of a culture. On an overcast Sunday morning, my cousin Rachel and I met Filipa in Campo de Ourique - an artistic neighborhood in Lisbon that has experimentalist gastronomy. This is an area you won’t find in the guidebooks. At this point in my travels, I had been in Portugal for almost three weeks and was still struggling to grasp the food scene. I had heard lovely things about Portuguese cuisine, however, I had continuously had sub-par experiences eating out. It was clearly time for professional help - enter Filipa in all her foodie knowledge. Upon arriving at our meet up location in Campo de Ourique, I was instantly intrigued because I had never heard of this area - something uncommon for a travel fanatic and avid researcher. Filipa soon explained that the reason many people do not come here is because it is a bit far from the touristy areas and is more residential. The neighborhood has a pioneering nature that inspires new food and lifestyle concepts - attracting artists, foodies and chefs who reinvent traditional spaces and concepts. With that said, I was convinced this would be an enlightening experience for me - someone who has doubts on the Portuguese culinary scene. However, what I quickly learned throughout the day was that I had been doing it all wrong. Let's get this straight - I DON’T LIKE SHELLFISH. I never have and I never will - or will I? This tour turned me upside down. Over the course of three and half hours, I ate an entire bucket of mussels, several plates of sardines and even tried egg sacks (not a fan of those). The point I’m trying to make is that when visiting Portugal - or anywhere when traveling - you need to try new things. During my afternoon with Filipa, I stepped out of my comfort zone and was rewarded immensely. The food experiences that I was dreading the most soon became my favorite moments, and that is saying a lot since our first stop had the “best chocolate cake in the world”. And what about the wine? We were able to try three different local types - rose, red and green (yes, you read that right - GREEN). Portuguese wines are at last getting the recognition they deserve, with the fast-emerging Alentejo reds joining reds from the Dao in bringing home gold medals. On summer days, like the day of our meeting, it’s common for Lisboetas to enjoy a chilled bottle of light and slightly sparkling vinho verde (green wine). Much to my surprise - again - the one I enjoyed most was the red. Traditionally, I don’t enjoy red wine, however, Portugal is best known for their fortified wine - port (porto) from the Douro region. It paired perfectly with the pork we were enjoying and I loved it so much that I ended up ordering it for dinner later that night. As our time with Filipa came to a close, we walked to our last destination - an award-winning Portuguese bakery known for their pasteis de nata - crispy little tarts filled with egg custard. For me, this was the ultimate way to end our afternoon. I probably had one of these tarts everyday while living in Lisbon for the month and I don’t regret a single calorie. If you’re planning on visiting Lisbon, I recommend jumping on a food tour the first day you arrive. Portuguese cuisine is fantastic - you just need to know where to go and what to order. Taste of Lisboa provided me with the tools I needed (and some killer restaurant recommendations) to fully enjoy the rest of my time in Lisbon. To end this article I wanted to share a few places recommended by Filipa that you should check out when visiting. I loved these spots and you will too! Enjoy your time in Lisbon! We were guests on the Taste of Lisboa food tour, however, the opinions are our own. We went on the Tram 28-Campo de Ourique Food & Cultural Walk. It had 7 stops, is three and half hours long and costs 60€. To book a tour or see the other tours available visit tasteoflisboa.com.